Attention all Hotels and Resorts! Hospitality Printer is doing it again!!! 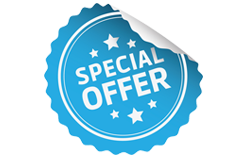 Yes we are extremely excited to roll out yet another special offer for our valued customers. This time, we’re giving you the opportunity to boost your marketing campaign with special printing and finishing effects for your Brochures. We will design and print not 100, not 500 but 1,000 Brochures! That’s right - get 1000 full-color, 2 sided, 8.5x11 Brochures with 100# gloss text (aqueous included) for only $149!!! We know that other companies charge much more. We'd rather help you grow your business and hopefully build trust with us. Hurry before this deal runs out. There’s no catch, no surprises. Call a Hospitality Printer rep today at 954.781.7771 for more details. You'll be happy you did!